Westminster is a city in Carroll County, Maryland. It is the county seat of Carroll County. According to the U.S. Census Bureau, the city's population was 17,715 for a 12 month period ending 1 July 2007. 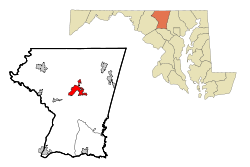 Westminster is located approximately 30 miles northwest of Towson. The Carroll County Public Schools (CCPS) system enrolls over 28,000 students, which makes it the ninth largest school system in the state of Maryland. In Westminster, there are two high schools: Westminster Senior High School, Winters Mill High School; two middle schools: East and West Middle School; and nine elementary schools. Westminster is home to McDaniel College (formerly Western Maryland College), which hosts the summer training camp of the Baltimore Ravens NFL team. Popular annual events in Westmister include the Carroll County Fair, Common Ground on the Hill, the Maryland Wine Festival, and Art in the Park.